RISE Fire Research has published a comparison of four different smoke toxicity test methods. The report compares results for four commercially-available insulation materials: black methyl methacrylate, five polymeric foams, two organic fibres and four mineral fibres. It is not specified what were the polymers or fibres but elemental analysis is provided. The mineral fibres contained 1.5-3.2% carbon, possibly bonding or covering materials. 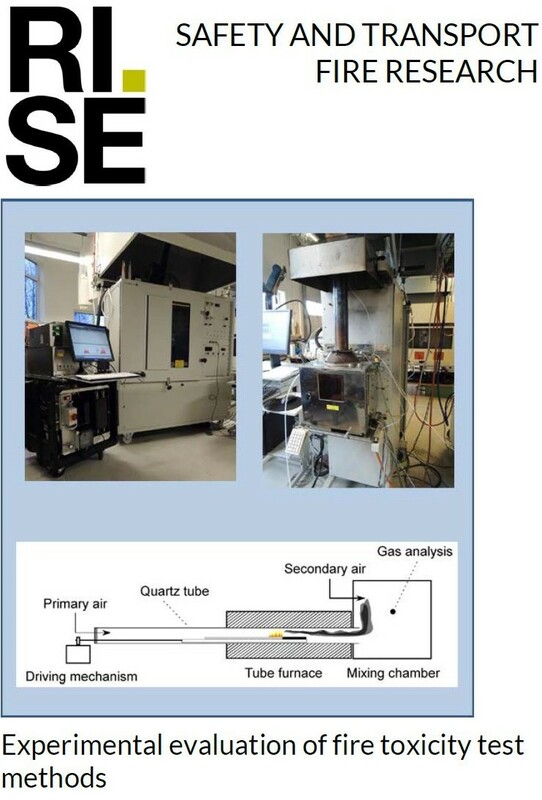 Four smoke test methods were used: ISO/TS 19700 Steady State Tube Furnace (SSTF), Controlled Atmosphere Cone Calorimeter (CACC), EN 4554-2 Smoke chamber Test and gas production by FTIR. Tests included flaming and non-flaming (pyrolysis) conditions. It is noted that different smoke gases are detected in different tests, for example HBr only in SSTF tests despite significant presence in one of the polymeric foams. The report concludes that, for flammable materials, the combustion behaviour is greatly influenced by the test conditions.